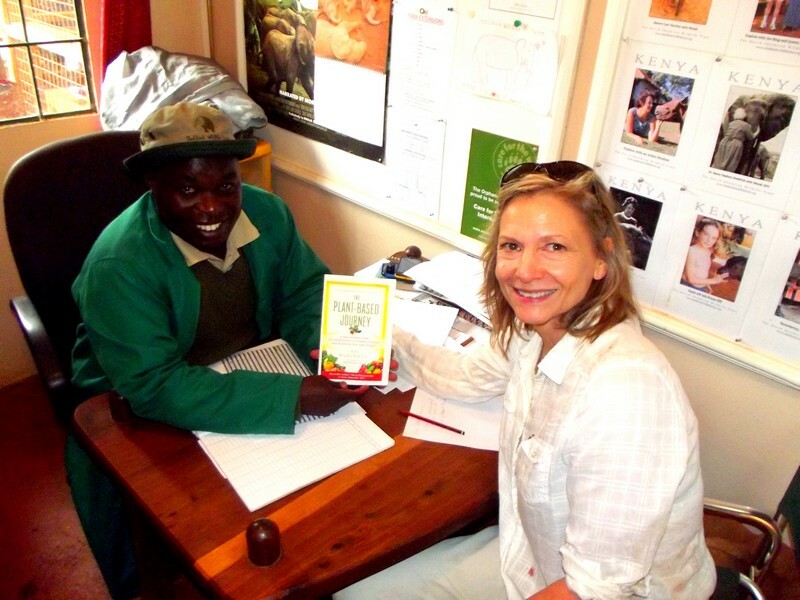 With Edwin Lusichi, Project Manager at The David Sheldrick Wildlife Trust for orphaned elephants, as he asks me some questions about plant-based nutrition – and we make plans for an upcoming event with the book tour for The Plant-Based Journey. 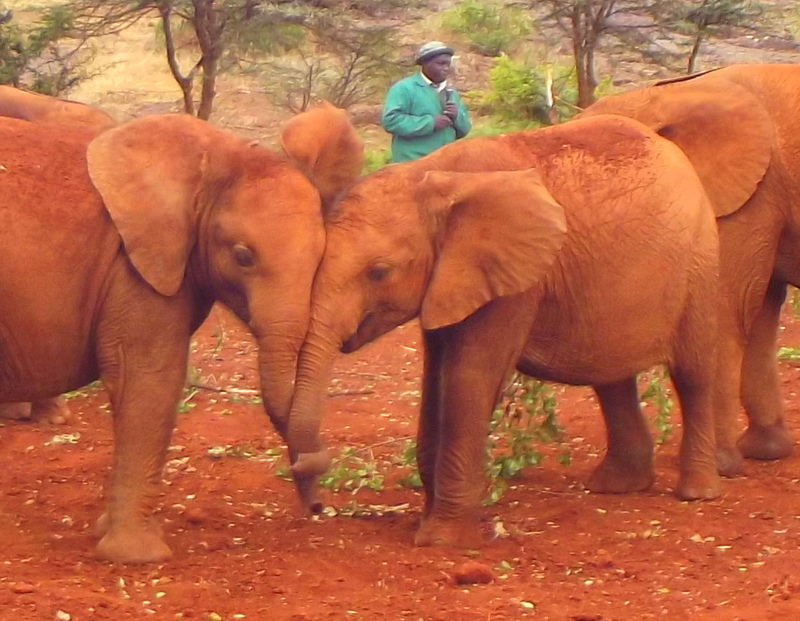 The event will also be a benefit for the David Sheldrick Wildlife Orphan Trust. Our driver scurried us through teeming traffic in a late-night arrival at the Nairobi airport to our lodging for the first days of our stay near Nairobi National Park. As we drove past giant billboards that had been erected days earlier to welcome President Barack Obama on his recent visit to Kenya, we couldn’t help but wonder what new encounters this adventure would bring. There’s already so much to tell you about this, our second journey to Africa, in just as many years. My husband Greg and I had come to Kenya a year ago to fulfill a growing draw to encounter the exotic, other-worldly African wildlife. Years of service as teachers of environmental science and multiple excursions into the wild as volunteer field biologists drew us here as well. Moments into that safari experience just twelve months ago, we were hooked on Africa. How extraordinarily fitting that the images on this page were snapped and filmed the day before World Elephant Day. 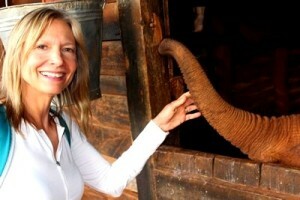 I know that you are no stranger to the plight of the elephants. These intelligent creatures have become the iconic representation of the sobering decline of wild animals and environmental degradation. For one, the disastrous loss of habitat due to human activity and overpopulation, as elephant habitat is being voraciously gobbled up by cattle grazing and human settlement. For another, human greed for ivory trinkets and ornamentation continues to result in the poaching of elephants poaching – a rate which has not declined. We’ve all heard about the intelligence of elephants, their intricate social relationships, their majesty and strength while building strong bodies on a diet of leaves, bark, and twigs – proving that plenty of muscle can be build on a plant-based diet. Yet observing their care, respect, and connection with each other first hand has truly been a life-changing experience. Humans are not the only animals that experience deep family bonds and intricate social relationships. The elephants, of all other species, perhaps demonstrate this in the most visible way. Once you’ve seen a group of adult elephants collaborate to mastermind the gentle rescue of an infant from a muddy well, or back themselves into a full circle around a young elephant to provide protection from approaching danger, your life is never quite the same. 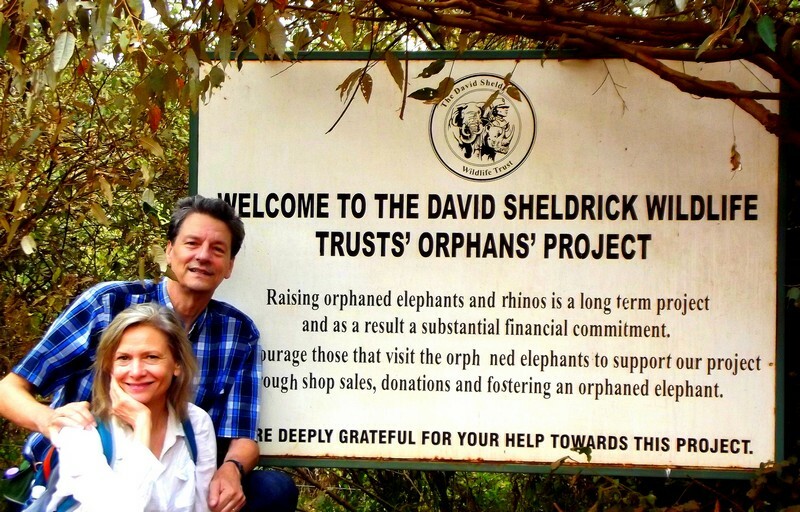 On our first trip to Kenya a year ago, we visited the David Sheldrick Wildlife Trust near Nairobi on no less than four occasions. 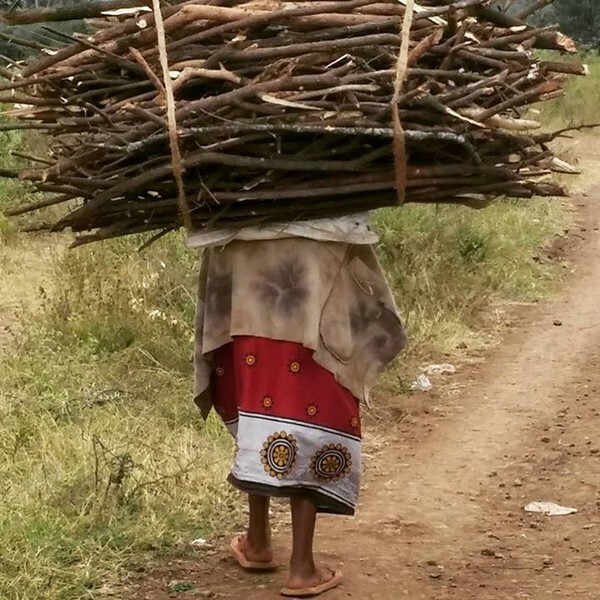 This gave us multiple opportunities to spend time with our first foster child, Mbegu, then a young five months old. With Mbegu at bedtime, at five months of age. She’s now grown to become one of the most well-known of the orphan elephants due to her unique ability to demonstrate the skills of a matriarch, caring for other new orphans in a way usually reserved for females far older than her young seventeen months. 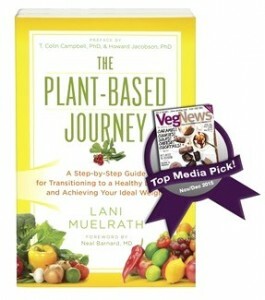 As a matter of fact, one of the recipes in The Plant-Based Journey – Mbegu’s Spicey Peanut Sauce – is inspired by Mbegu. This visit also gave me the opportunity to share with Edwin first hand my plans to draw more attention to the Sheldrick Trust and the plight of the elephants in an upcoming event on The Plant-Based Journey’s book tour. This event will also serve as benefit for the Trust. Edwin was pleased to hear about the benefit but also quite interested in Journey, asking me questions about plant-based nutrition. Yet this wasn’t my first visit to the orphanage office on this day. We had arrived at the orphanage well in advance of visiting hours scheduled for 11:00 a.m. 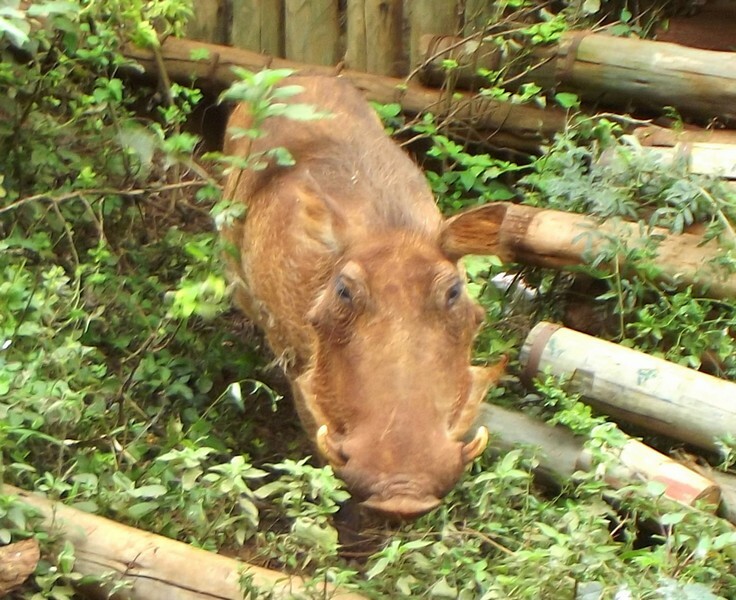 The orphanage grounds are teeming with wildlife, including the comical yet mighty warthogs. We don’t know whether I was simply in his way of escape from another warthog or if he just preferred me off the trail. Seconds before this warthog tossed me into the air like a salad. But seconds later he charged toward me, butting full body weight against me which had me soon flat on my back, muddied and torn with contusions on my arm, back, and legs – and back on my feet faster than I’ve even been in my life. I recall seeing my feet in the air above me before hitting solid ground with a full thud. Discovering the damage after a wildlife encounter that lasted a fraction of a second. Wild animals are…well, wild! No matter how tame, funny, and friendly they appear. 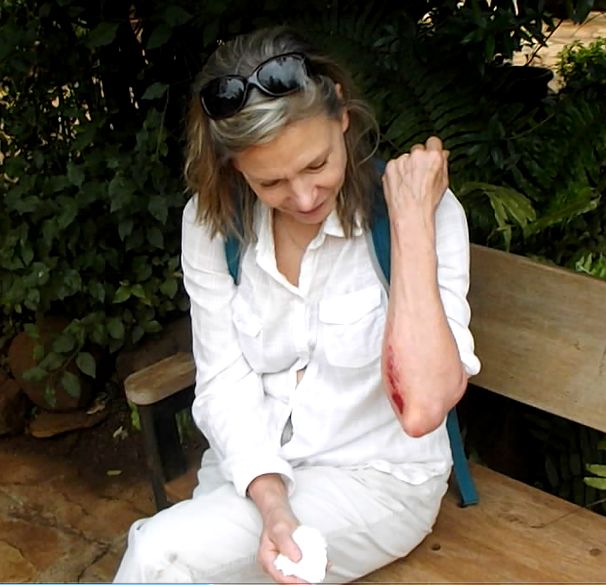 I’m fine, a bit bruised and scratched and in recovery – and ready for our safari liftoff scheduled for tomorrow. First, it’s back to the orphanage to see the kids, and report in to friends on their adoptees. We’ll be back here post safari to visit again. So much more to tell you about already! But it’s time to head out to the afternoon adventure to the orphanage, then to dinner at the lodge restaurant down the road where we’ve discovered some delicious plant-based food (photos below of yesterday’s lunch), and liftoff on the next leg of our journey before dawn tomorrow. Nothing like a warthog encounter to whip up a good appetite! 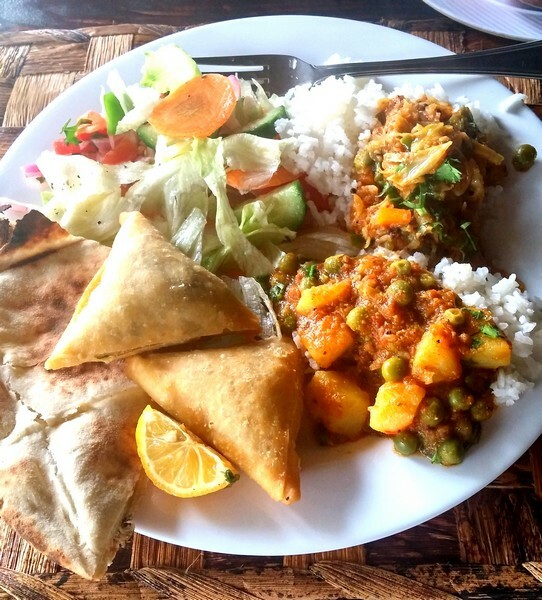 Curries, naan, salad, rice, and samosa…. Here’s what it looks like on the plate…and yes, it tasted as good as it looks. Have you, or have you ever had a desire to visit, Africa? I’d love to hear about your experiences! 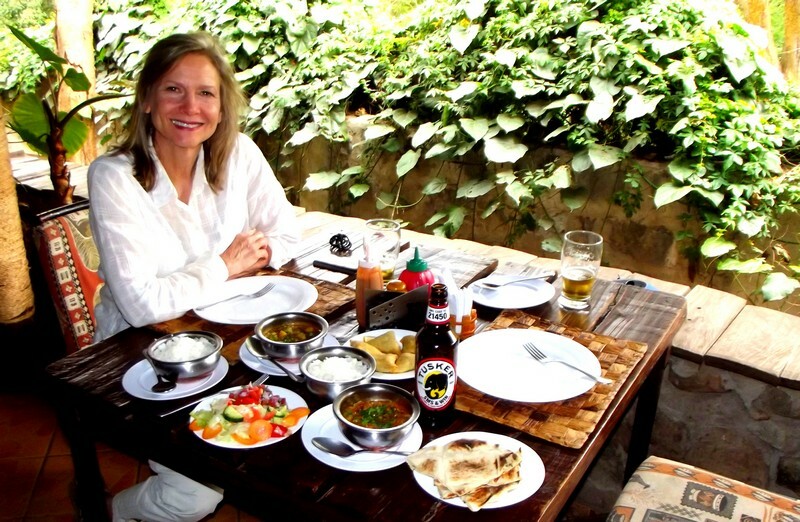 More coming – I’ve got to tell you more about the food on safari! I love this post! Sharing about your work with the animals as you do means a lot to me personally – and it’s a part of your message that I think is so important. How lucky for you to be able to go to Africa. The wart hog story – really? And the food looks great. You say you’ll be reporting in more on that as your trip continues – can’t wait! Have a good time and watch out for those warthogs! Hi Gina! 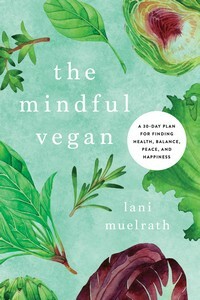 I’m so glad you like the story, the animals and humanitarianism were the very first things that turned my head with changing to a vegetarian diet. And now it’s gotten more urgent than ever, for so many reasons! Yes, I’ll report in more on the food – and watch out for the warties! Thanks so much for sharing, Lani. I’m eager for every post. It’s generous of you to take time away from your adventures to share with us. Heather! thank you for your note and I love knowing that you come by to join the journey here on the blog! 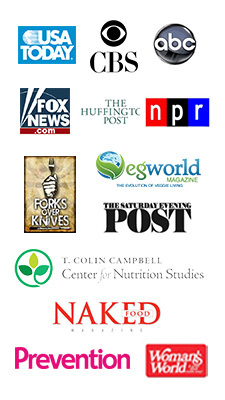 It multiplies the pleasure of the journey to share it – and it also brings important awareness to a greater audience. 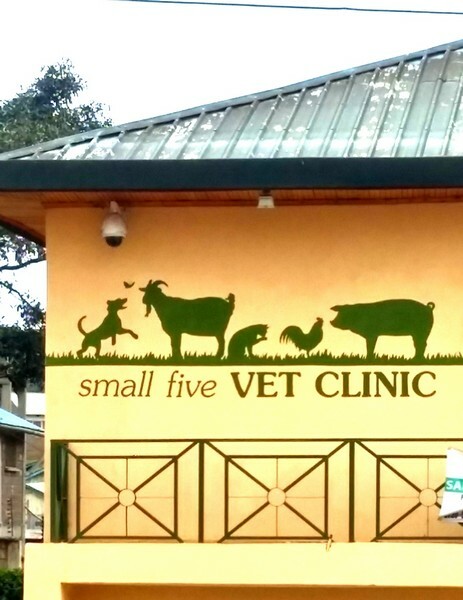 This brings back fond memories of my homeland Kenya. Its always good to hear great things about my country instead of the negativity people tend to concentrate on. The food looks yummie and makes me want to whip up something just as good. Thanks for sharing your encounter with the warthog, looks like you healed nicely. Yes! wild animals are wild, I have witnessed such experiences or worse when people tend to treat wild animals as pets, (even after a warning). Always great hearing about your adventures and seeing great pictures. You are from Kenya? How long ago did you leave here? In which part did you live? I am enjoying your observations and comments and appreciate so much that you popped in to share. Glad you like the food photos, too – more coming as the safari unfolds! 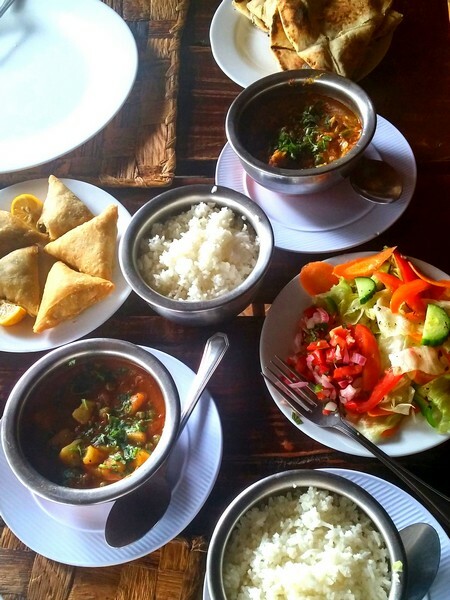 Last year on safari we were concerned before arriving about getting our plant-based meals but our fears quickly evaporated – there were always endless options for us, even more veg plates than meat plates. More soon and thanks for sharing! I’m from a city called Nakuru in the Rift Valley. I have been in the US for twenty years and have been going back and forth. Will be there in December, its always refreshing to go back because I see it in a different light and appreciate things I took for granted growing up there. Hope you can get to Nakuru to see the flamingoes. Yes – you never have to worry about veggies, you can find different veggies from different regions, always fresh. Can’t wait to read and see more. Enjoy and stay away from the warthogs. This was such a beautiful post. I’m glad you’re having a wonderful time and that you were not seriously hurt by Mr. Warty. Looking forward to your updates, too! What an adventure! I’m glad you’re OK after your warthog encounter. I’m cracking up seeing a bottle of “Tusker” at the post tossing meal! Thanks for all you do for animals.